Last weekend, me and my fellow explorer Craig, visited an exhibition that we’ve been looking forward to for a while. At the Museum of London Docklands, ‘Roman Dead‘. This exhibition tells the stories of some of the people of Roman London, as seen through the evidence of their mortal remains, and of the funerary practices and methods of commemoration used by Roman Londoners. Literary evidence tells us that the ancient burial grounds of Londinium began to be discovered at least as early as the 1570s as John Stowe writes, in his A Survey of London in 1598, that as the ground around Spitalfields was being broken up for clay, the workers discovered cinerary urns (pots used to hold the ashes of people who were cremated), the cremated bones and other remains of earlier Londoners. 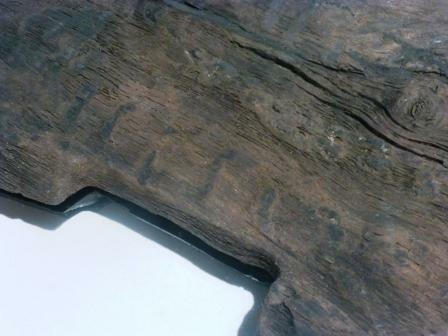 This burial group, dating to 60-200CE, was found at Bishopsgate. 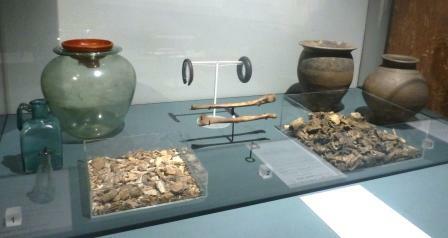 The large glass jar would have held the cremated remains (in the tray in front), with a samian cup used as a lid. The smaller glass jars may have been used to hold oils and perfumes used in the funerary rites or offerings to the gods. 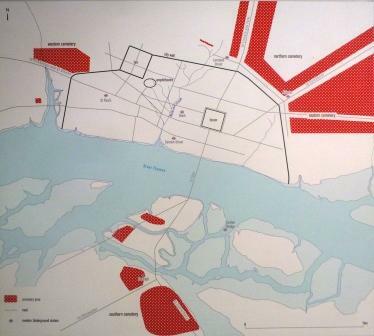 I was interested to see the map of known burial grounds around Londinium (in red), particularly the two on the Southwark islands. The burial grounds were situated just outside the city limits to avoid the pollution of the living by the dead and archaeologists have unearthed evidence of a wide range of funerary practices carried out by the people of London. The exhibitions includes evidence of cremations and inhumations (burials), a range of grave goods, buried with the deceased, and evidence of some more unusual practices. For example, the skeletal remains of a woman whose skull was removed, after death and possibly much later, after the body had decomposed, and placed on top of her pelvis. As it is today, so it was in Roman London. We see people from all over the Roman world; from Britain and all parts of mainland Europe, the Middle-East and North Africa, and they all came to, or travelled through Londinium. Some of them died here. Some of these different funerary practices may have been influenced by people’s different areas of origin, by changing tastes and even by changing religions, but some perhaps also by the desire to ‘do what Granddad would have wanted’, possibly harking back to older tribal or cultural traditions not current in Roman Britain but which, in the face of death, felt to surviving family members or friends like the right thing to do. The objects in the exhibition work around the people in the exhibition. Well, the remains of the people anyway. As well as cremated remains, on display are the skeletal remains of 28 individuals. With funerary collections, I particularly like to see the whole assemblege, or as much as possible of it, displayed together, if possible reassembled as it was in the ground. I think that seeing all of the objects together with the remains can tell us something about the people themselves, but also about their loved ones, their friends, the people who arranged and carried out the funeral rites. We can’t see the remains exactly as those people saw them at the point of burial, but it’s the closest that we can get. Gold finger ring with an engraved intaglio showing two mice. Possibly referencing the story of the town mouse and the country mouse. Finger ring with an engraved intaglio. Tiny glass jar, possibly for unguent. Rattles used in funerary rites. 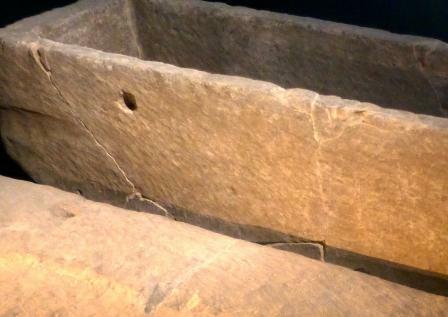 The centrepiece of exhibition is this well preserved stone sarcophagus found last year near Harper Road in Southwark. 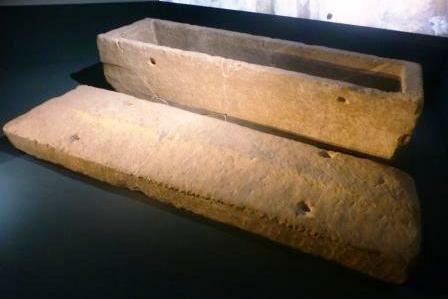 Stone sarcophagi are rare in London, this is only the third one found, so it’s a big deal. 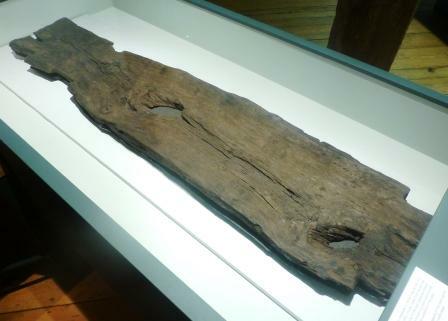 Most people buried in Roman London would have been buried in wooden caskets or possibly just laid in the ground wrapped in a shroud, so the lady interred here, and her family, must have been quite wealthy to be able to afford such a burial. This is the first time that the sarcophagus has been shown and I was struck by how big it is. It’s not overly wide, but it did look really long. 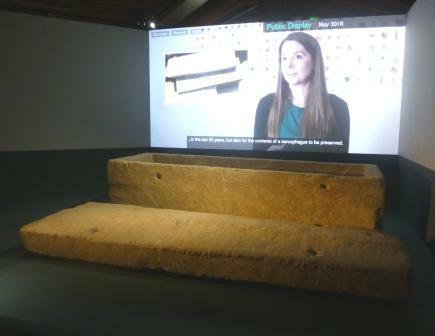 In the accompanying film archaeologists, conservation experts and one of the curators talk us through the discovery, recovery, investigation and conservation of the sarcophagus. When it was discovered, the archaeologists could see that it was badly cracked so it wasn’t excavated onsite. Instead a wooden frame was constructed around it, holding it firmly together and allowing it to be lifted out of the ground by crane, still filled with earth that had accumulated in it, and taken to the lab to be excavated in more controlled conditions. The breaks int he stone are very visible, even after conservation. In the lab the remains of the occupant and a few fragments of the grave goods were found, already disturbed by grave robbers. There’s no way to know all of the objects that the lady was buried with, but the few pieces that remain include an engraved intaglio, probably from a finger-ring, and a tiny fragment of gold, possibly the remains of an earring. It may not look like much at first, just a rough plank of wood. And so it is, but it has been reused as the base of a wooden coffin. 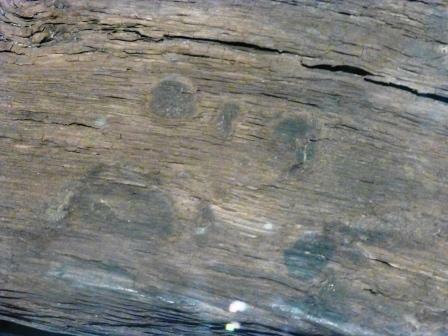 Close inspection reveals some marks left on the wood. The imprints left by the body. The marks left by the knees. This, for me, was the object that really made me go “Wow!”. The dead really do leave a lasting impression. 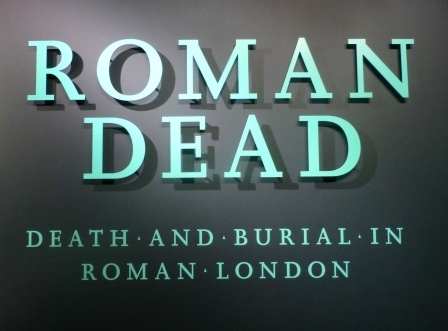 The Roman Dead exhibition is at Museum of London Docklands until 28th October 2018 and it’s free to visit. Yes! Free! This entry was posted in Archaeology, Art and exhibitions, London, Museums and Exhibitions, Roman Britain, Romans, The Big Wide World, Uncategorized and tagged amphitheatre, Archaeology, burials, Christianity, cremation, funerals, gladiators, Harper Road, LAARC, London, MOLA, Museum Blogger, Museum Diary, Museum of London, Museum of London Archaeology, PCA, River Thames, Roman, Roman gaming, Southwark, Thames. Bookmark the permalink.